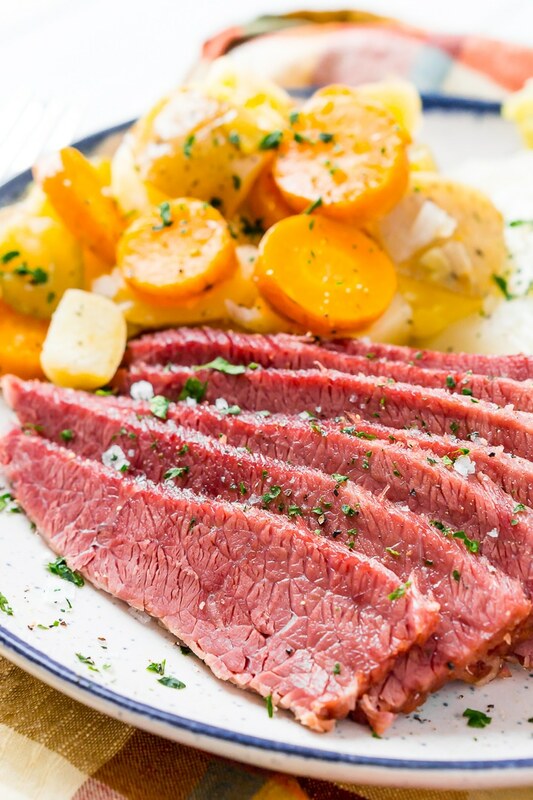 This Corned Beef and Cabbage recipe is a classic Irish dinner perfect for St. Patrick’s Day! The meat is brined for 7 to 10 days in savory spices and the brisket becomes tender and flavorful once cooked. 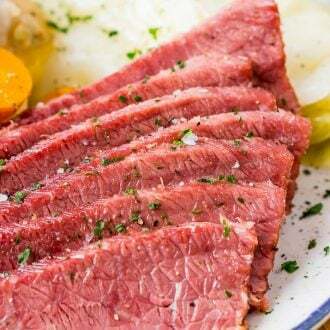 If you plan on preparing a traditional meal this Saint Patrick’s Day, a recipe for house-brined Corned Beef and Cabbage should be at the center of the feast! 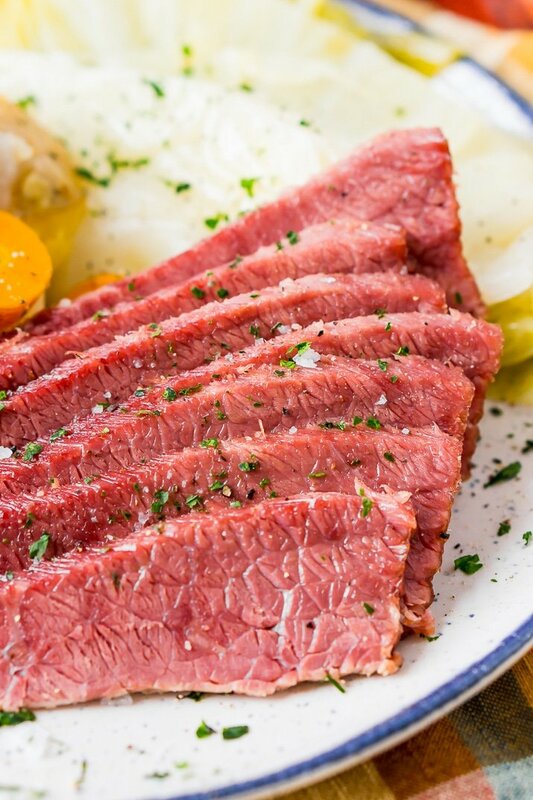 Have you ever wondered how corned beef became a St. Patty’s Day staple? Believe it or not, the tradition didn’t begin in Ireland. 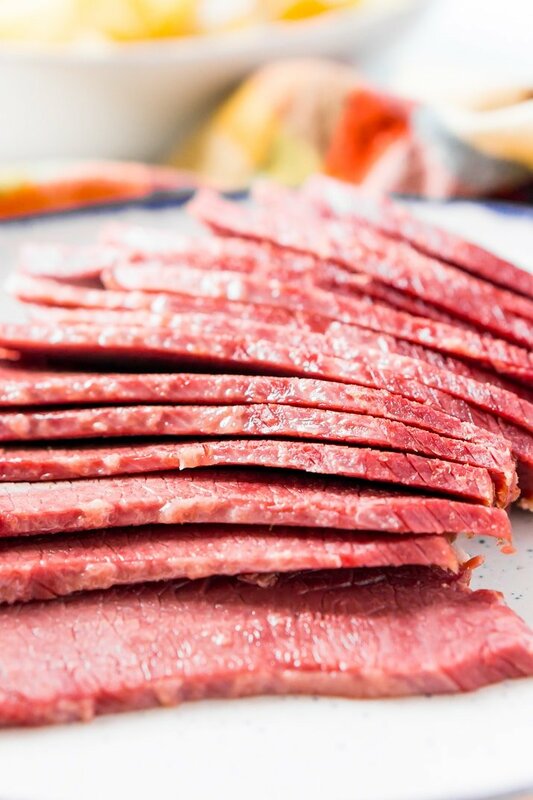 The Irish used to export corned beef to other countries, but it was too expensive for the locals to eat themselves. But when the Irish immigrants came to the U.S. in the 19th century, they found that it was actually more affordable and available in America. What’s more, salted pork – one of their staples in Ireland – was pricier in the new country. So, corned beef was a natural choice when in came to celebrating Saint Patrick’s Day! Are you hoping to continue the tradition? You’re in luck because this recipe is amazingly delicious! While this Corned Beef and Cabbage recipe is pretty easy to follow, you definitely need to plan ahead of time. After the brine is made, the brisket needs to brine in it for 7 to 10 days! This stock is infused with spices like garlic, cloves, bay leaves, cinnamon, pink curing salt, and sugar. These savory flavors, with just a touch of sweetness, seep into the meat and make it tender, juicy, and salty. While the beef needs to brine for up to a week and a half, the prep is actually pretty low-maintenance. It basically just sits in the fridge with the liquid needing to be rotated from time to time. Even though the brining in this recipe is time-consuming, it’s so worth it! When it’s time to enjoy your Saint Patrick’s Day meal, simply boil the meat until it’s cooked through. After soaking in spices for so long, the brisket is juicy, flavorful, and basically melts in your mouth! Along with sides like Irish Fried Cabbage and Bacon and the Best Mashed Potatoes, it’s like Saint Patrick’s Day comfort food at its finest. And let’s not forget all the delicious ways you can use those corned beef leftovers! Corned Beef Hash blends shreds of brisket, potatoes, onions, and eggs for a savory, satiating breakfast. I also love putting corned beef on my burgers with Guinness-fried onions (YUM! ), and let’s not forget, this meat can make a killer Reuben! If you want to proudly celebrate your Irish-American roots on Saint Patrick’s Day, this Corned Beef and Cabbage recipe is perfect to share with your family and friends. Making it from scratch is a bit of a labor of love. It takes about 7 to 10 days for the meat to brine if you want to do it right, but luckily that’s pretty much hands-off time other than checking the bags each day to ensure they’re not leaking. In a large pot, combine the water, salts, and sugar and bring to a boil and cook until sugar and salt have dissolved. Let cool on the stove until it reaches room temperature. Divide the bay leaves, cloves, cinnamon sticks, and garlic between two gallon Ziploc bags. Add a piece of brisket to each bag. Ladle to the brine into the bags making sure to fully cover the meat, you do not want any part of the meat exposed to air. Place the bags in a 9×13-inch pan in case they leak. Place in the fridge for 7 to 10 days before cooking, checking daily for leaks and rotating the bags ever two days. Once the brining process is over, remove the bags from the fridge and rinse off the meat. Add the meat to a large pot with the celery, onion, and carrots and add enough water to cover the ingredients. Boil for 1 hour and 45 minutes, checking periodically and adding more water as needed. Add the cabbage to the pot and boil for another 45 minutes. Use tongs to remove the corned beef and cabbage from the pot. Let the rest of the pot contents come back to room temperature and discard. Slice beef and enjoy, save any leftovers for fried cabbage or hash. Pin this Irish Dinner Recipe for Later! You’re probably wondering why the recipe includes celery, carrots, and onions but they get discarded at the end of the cooking process. Well, these are considered the Holy Trinity of cooking and are primarily used to add flavor to the beef. Of course, no one will stop you from eating them if you’d like, but they will be very mushy. Yes, the 7 to 10 days really is necessary for the best flavor. You might be able to get away with 5 or 6 days, but I wouldn’t do any less than that. If you didn’t plan ahead, you can still use the cooking section of this recipe with a storebought brisket. When it comes to brisket, not all cuts are created equal, look for the flatter end of the brisket, this will have less fat, will brine better, and will cook more evenly. The Pink Curing Salt or Prague Powder is a very important part of the recipe and shouldn’t be skipped. This is not the same as Pink Himalayan Salt. It may be hard to find in your local grocer so I recommend ordering it online. 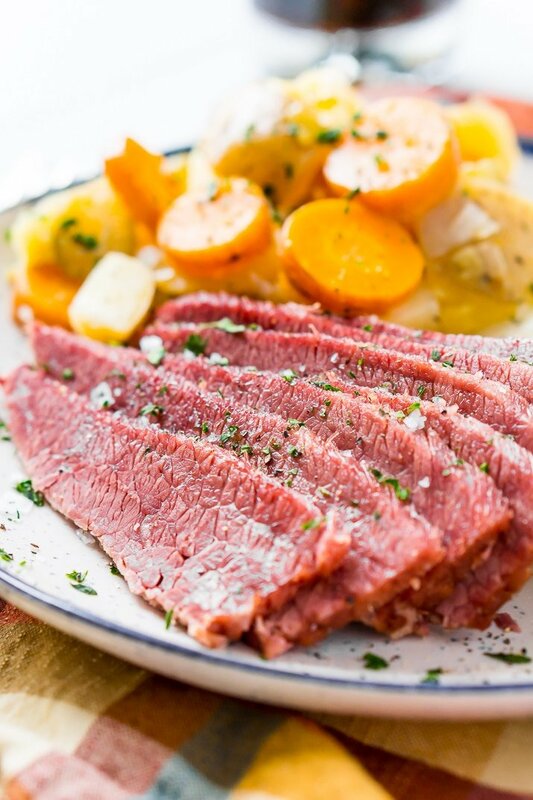 This Corned Beef and Cabbage recipe is a classic Irish dinner perfect for St. Patrick's Day! The meat is brined for 7 to 10 days in savory spices and the brisket becomes tender and flavorful once cooked. Place the bags in a 9x13-inch pan in case they leak. Place in the fridge for 7 to 10 days before cooking, checking daily for leaks and rotating the bags ever two days. 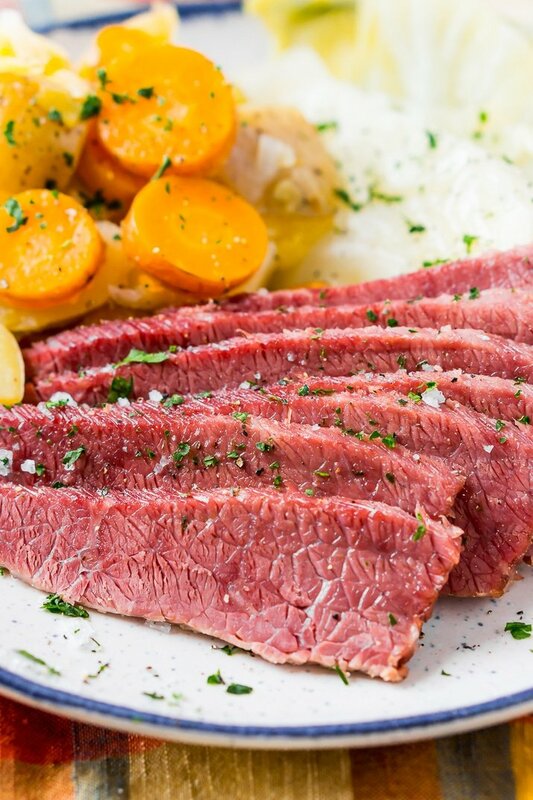 Slice corned beef and enjoy, save any leftovers for fried cabbage or corned beef hash. You're probably wondering why the recipe includes celery, carrots, and onions but they get discarded at the end of the cooking process. Well, these are considered the Holy Trinity of cooking and are primarily used to add flavor to the beef. Of course, no one will stop you from eating them if you'd like, but they will be very mushy. Yes, the 7 to 10 days really is necessary for the best flavor. You might be able to get away with 5 or 6 days, but I wouldn't do any less than that. If you didn't plan ahead, you can still use the cooking section of this recipe with a storebought brisket. The Pink Curing Salt or Prague Powder is a very important part of the recipe and shouldn't be skipped. This is not the same as Pink Himalayan Salt. It may be hard to find in your local grocer so I recommend ordering it online. Sodium levels in this recipe are high but are not as high as the nutrition labels says. Most of the salt will be discarded with the brine and there's actually between 1200 and 2000 mg of sodium per serving in the meat. How perfect I found this with enough time to brine it for the time required. Followed the directions that were so easy peasy and its brining in the fridge as I write this now! If it is half as good as the photos make this look Im going to be one happy happy girl! I hope your family loves it, Michele! My only experience of corned beef is from a can as a child. Shamefully, I didn’t even know you could make it this way! Please set the table for one more on St Patrick’s Day. I’m sold! Oh, you must try it this way, so much better than the can! This sounds (and looks) wonderful. I crave cb+c (corned beef and cabbage) around this time of year, fo sho!